cleanliness is important, however it doesn’t have to be clinically clean – after all, who would expect a several hundred year old inn not to have a cobweb or two in the corner?! some might consider this a bit narrow minded, but if I haven’t been to a place before and it hasn’t got at least a very good rating on Tripadvisor, I almost certainly won’t use it for my guests. I have to have a benchmark, and whilst Tripadvisor isn’t fool proof, it is the best reference point I’ve got apart from other people’s local knowledge. This might seem like a restrictive list of attributes, but something has happened in Devon in recent years, and that is an incredible rise in standards of the food we produce and serve up in our establishments. A realisation seems to have occurred across the board that we have some of the best quality meat, fish, vegetables and fruit in the World, coming forth from right on our own doorstep, and I have heard that Devon is now considered a centre of World gastronomic excellence. You can challenge me about where I heard this, but I can’t remember, so you’ll just have to believe me and try out some of the places that I recommend! The rise continues, and to celebrate this we offer a Food and Drink of Devon Tour to our guests! I have to mention that my list of twenty places (spilt into blog parts 1 and 2) leaves out an absolutely huge number of potentially excellent eating establishments, essentially due to the fact that I have only eaten at a fraction of the total places that there are to eat in across Devon. And whilst I try to seek out new places to take my guests to, I am often dictated to by the particular tour we are on as to where we can eat. I apologise to anyone reading this in some parts of Devon that the list indicates I have completely ignored, but my disclaimer is that although I have been a tour guide for nearly six years, I’ve still got a lot of Devon left to visit, and therefore a lot of places in which to eat. I am based in the countryside a few miles from Newton Abbot, and the majority of my tours take place on Dartmoor, and in the South Devon, Torbay, Exeter and Plymouth areas. I have brought guests to all the other parts of Devon, but not nearly as frequently as the areas I’ve listed. So, time for the list. It is not definitive, it’s in no particular order, and it’s just my humble opinion. Visit them on my say so if you wish, with the assurance that if I had a guest booked on a tour for tomorrow, I wouldn’t hesitate to take that guest to any of these places. Of all the places that we take our guests to, The Rugglestone is certainly the one that we visit the most. The reason is partly because we do so many guided tours on Dartmoor, not surprising as it is one of Devon’s most significant areas for visitors to want to go to, and partly because The Rugglestone is unfailingly excellent, with Richard and Vicki, the owners, always providing our guests with the greatest customer care and delicious food. 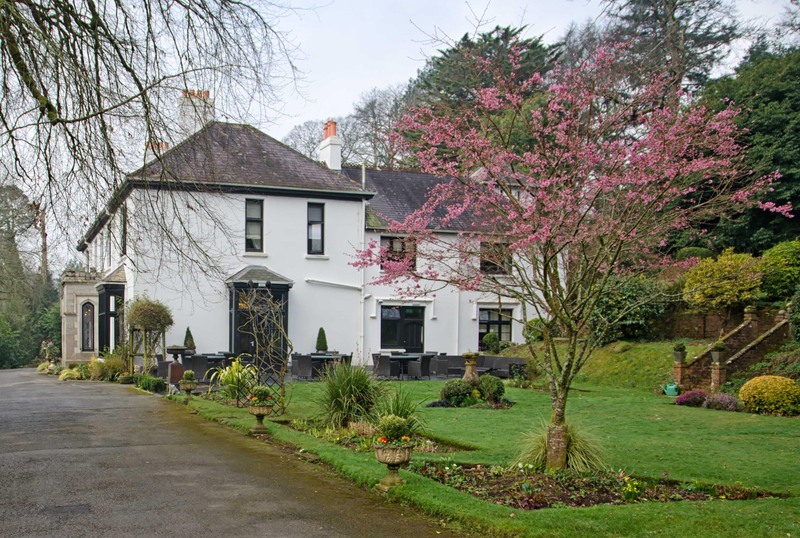 The location is charming, just tucked a little distance out of the ever popular Widecombe, and with a stream running through the garden. 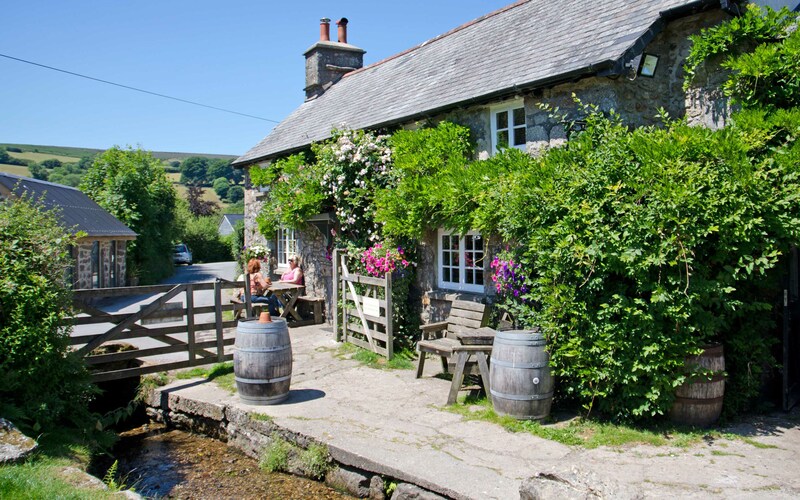 The pub itself is typically ‘Dartmoor’, unchanged and cosy. Richard and Vicki have just the right approach, ensuring that if you have steak and stilton pie one week, it will taste just as good the following week. Consistency must surely be one of their watchwords. Great local beer and cider gives my international guests something new and interesting to try, and the portion sizes sometimes even surprise visitors from countries were the portion sizes are notoriously big! The Rugglestone Inn never fails to deliver! There is no better way to put it than to say that I love this place! I’ve been coming here for several years now, long before I became a tour guide. 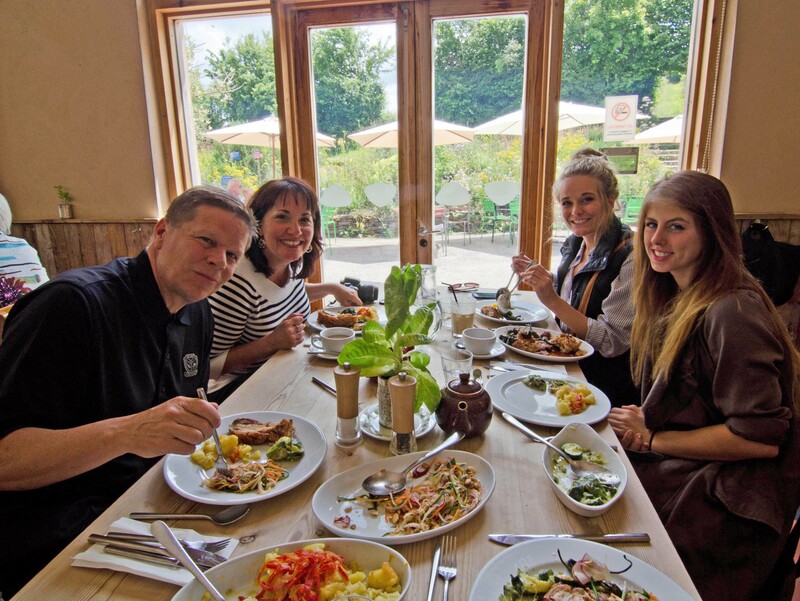 It was always our social group’s favourite place to come to if anyone had a birthday or other celebration, and nowadays I try my best to convince my guests of the value of a visit to Riverford Field Kitchen, situated between Dartington and Buckfastleigh. The food that is served here comes straight from the fields, Riverford’s own, whether it be meat or veg, and the flavours in the originally made up dishes are just magical. I’ve even told people that if their children have a problem with eating vegetables, then this is the place where they can convert them! Apart from the fabulous tasting food, including their famous sticky toffee pudding, the place had a unique atmosphere. It is not quite a restaurant or cafe, and actually more akin to a school dining room. The feel of the place is one of casual sociability, where it is fine to mix with the people next to you who you’ve never met before, but you are sharing a dish with them, so best to be friendly! If you go in with some mud on your feet it really doesn’t matter, and if you once you’ve been, you will most certainly return again, I guarantee it. I’ve been lucky enough to have breakfast, lunch and dinner at this wonderful hotel, so I can speak from the heart (and stomach) to say that the food here is fabulous, and very lovingly prepared, cooked and served up. The whole hotel has a sense of charm, as if it had won the lottery, fallen in love, and passed a degree, all in the same day, such is the wonderful atmosphere that exists here. This is a blog principally about food, but whatever the reason one has to visit Glazebrook, you won’t go away disappointed! I must be one of Taylor’s most regular visitors, I’m sure of it! Whether it is for a mid-morning coffee and cake, a sandwich for lunch, or a Devonshire cream tea, I am here a lot with my guests! There are good reasons for this, of course. Firstly, the town of Ashburton is a favourite of mine, with its fabulous array of independent shops, including the excellent Moor Chocolate, My Fabulous Things, and Silver Lion Jewellers, and its many antique shops. It also has an unspoilt character and never gets too crowded. Secondly, we visit this town during the Hound of the Baskervilles Tour that we offer, because this is where the coachman lived later on in life that showed Conan Doyle around some of the area – his name was Henry Baskerville! Thirdly, and most importantly, Taylors is lovely! It has understated English charm – ‘quintessential’ is what my overseas guests often say! When they were planning their trip to Devon, they were dreaming of place like this, where the china cups are old, the cakes are delicious, and the cream teas are perfect! 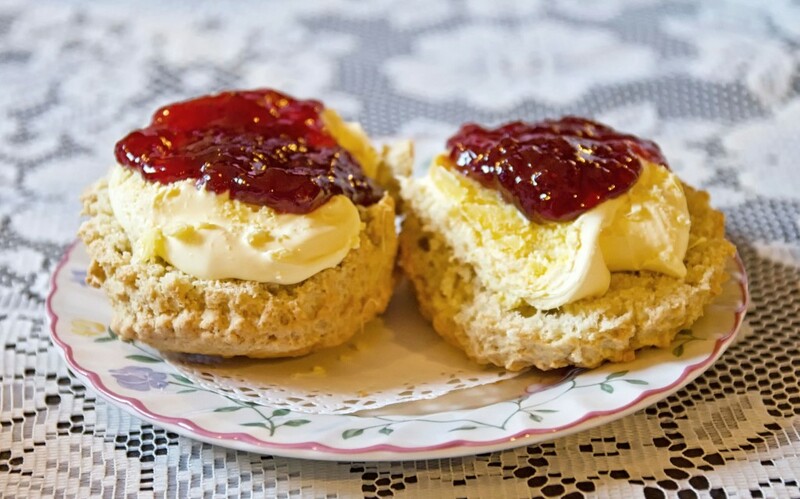 Scones, clotted cream and jam, the most important parts of a Devonshire Cream Tea! I am not much of a fan of seafood, I’ll be honest. But I do love great fish and chips, and Rockfish is just about the ultimate place to eat this classic British dish. They now have five restaurants in the area (Dartmouth, Torquay, Brixham, Plymouth and Exmouth), but the one I tend to visit most is in Dartmouth, and it is always a hit with our guests. 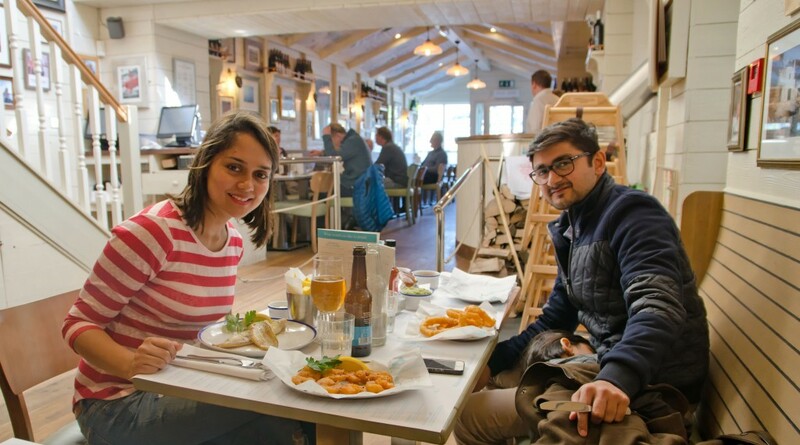 The restaurant actually represents, for me, all that is great about the Devon fishing industry, with an extensive and original seafood menu, and very fresh produce being the norm of what is on offer. I love the moment when, towards the start of the meal, the waiter or waitress comes over and marks your paper place mat with what the local catches of the day are. The likes of Gurnard, John Dory, Turbot and Brill are amongst the beautifully named fishes that get highlighted as being fresh into the fish market that morning! The reception here is always excellent, even during the height of the summer when the tables are at their fullest. The atmosphere is light and bright, and is perfectly in tune with everything sea related. If you do go, take the time to pause in the toilet/loo/restroom/bathroom/WC (I never know what to call it these days!) and listen to the great fun interpretation of the shipping forecast that comes through the speakers – it’s very funny indeed! Location is sometimes everything, but in this case it is not just everything, as the food served up at The Cellar Door is fabulous, just like the setting of this al fresco restaurant. The food is always incredibly fresh here, and full of great flavour, and it can all be accompanied by award winning wine from Sharpham. 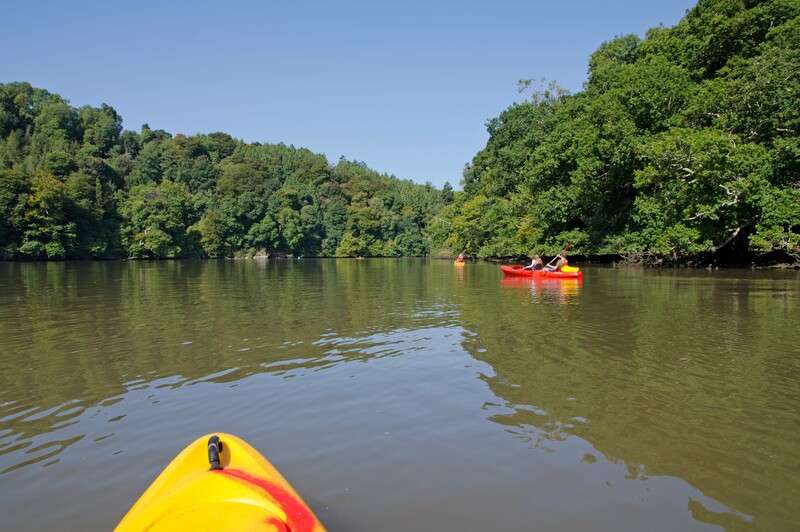 One real treat, and I did it recently with my family, is to hire some kayaks from Stoke Gabriel, for instance, then paddle up to Sharpham, enjoy a leisurely lunch and flight of Sharpham wine, then meander gently back to your starting point four or five hours later. It’s the perfect way to spend a sunny day! I love The Nobody Inn, and I love taking guests there too. Before becoming a tour guide I had my 40th birthday here, and I’ve never looked back, regularly introducing guests to the delights of this old inn. 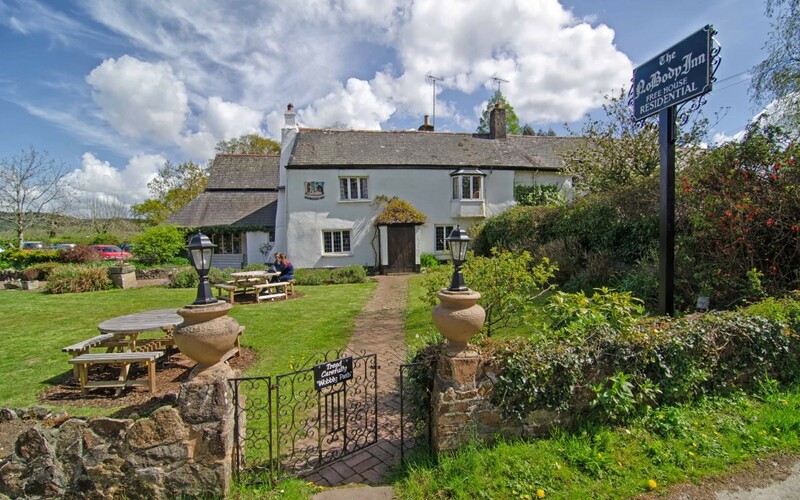 The drive there is a joy, through classic Devon lanes and scenery, and there’s always an audible ‘coo’ of joy from my guests when they first set eyes on this pretty building, with its colourful beer garden. Inside it is full of character, with anyone over average-height having to duck due to the old low ceilings. Their food is superb and plentiful, and they pride themselves on their drink selection! A huge cellar of wine is overshadowed by their whisky selection – they have over 250, I kid you not! This inn is a talking point, and my guests and I always have plenty of subject matter to discuss when in these lovely surroundings. Most people like a good, home cooked pie – if you like the tastiest home cooked pie, then I advise you to take a trip to Pie Street in Totnes. They are truly amazing, and just thinking about them has got me drooling (sorry to present you with that vision!). They do several fillings, from Steak & Devon Blue, and Creamy Chicken, Ham & Leek (my current favourite), to Vegetarian Homity, and their curry of the day pie. They are all delicious – I know as I’ve tried them all, and they are served up with some of the tastiest chips you can find. You can also have greens (to balance it all out!) and really good gravy. 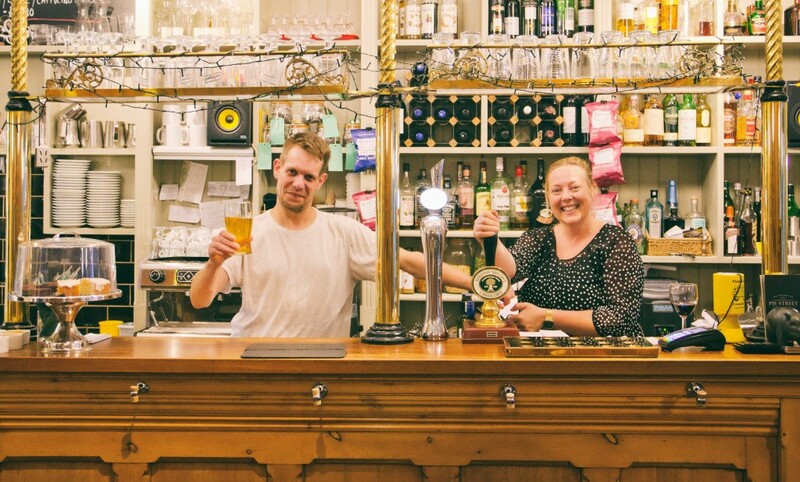 Bill, the owner, and his staff always give their guests a hearty and warm welcome, and being as it’s located in the quirky and interesting town of Totnes, there is plenty to see and do before or after your meal. One of the priorities for me at mealtimes, especially when with guests, is that we receive excellent customer service. I can honestly say that last September, that’s exactly what my guests and I received during a lunch, and without doubt it was the very best customer service that I have ever received! My guest from California had her 75th birthday, and my brief was to take her and her two friends to “somewhere very special” to celebrate. After a private guided tour at Powderham Castle, we headed to Lympstone Manor, and from the word go we were treated quite beautifully. The Signature Tasting Menu was the order of the day (thankfully I wasn’t paying! ), and we sat there for three hours eating food fit for royalty, with the waiting staff ever attentive, but not once intrusive. I was incredibly impressed, and so were my guests. For an extra special treat, Lympstone Manor is as good as it gets! Treats at the end of our Lympstone Manor feast! This place was created with love, the love of the two people that own and run it, Kate and Queenie, and all their wonderful staff, and it really shows. It almost feels as if the place itself has a sense of humour, such is the ever present joy that fills the atmosphere. I’ve been lucky enough to eat here several times, and not only am I never disappointed, but I’m actually always delighted. Barry, the head chef, cannot do enough to make sure that everyone is more than satisfied, so you’re assured an excellent meal and experience when you come to Cantina, as well as a very full stomach, as they really do like to feed you up! 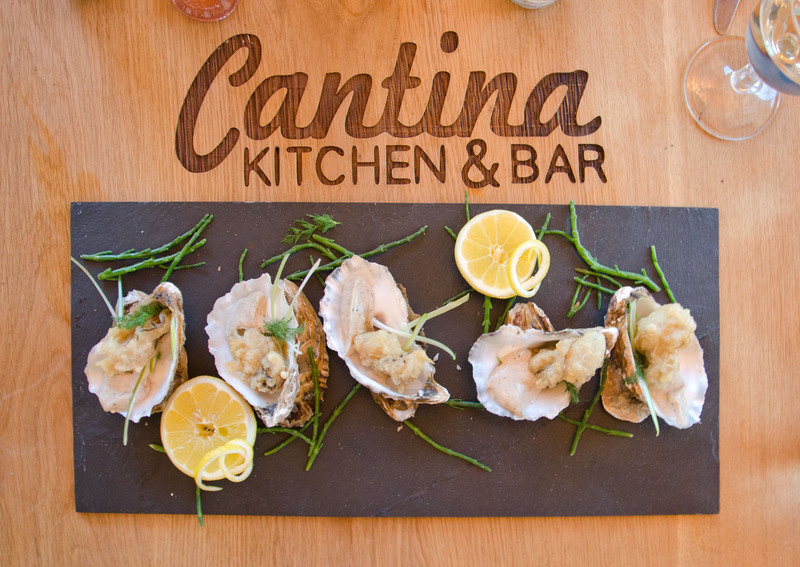 Oysters at Cantina, presented beautifully!